Hirokazu Kore-eda and Spike Lee with the Palme d"or and the Grand Prix Award at Cannes 2018. 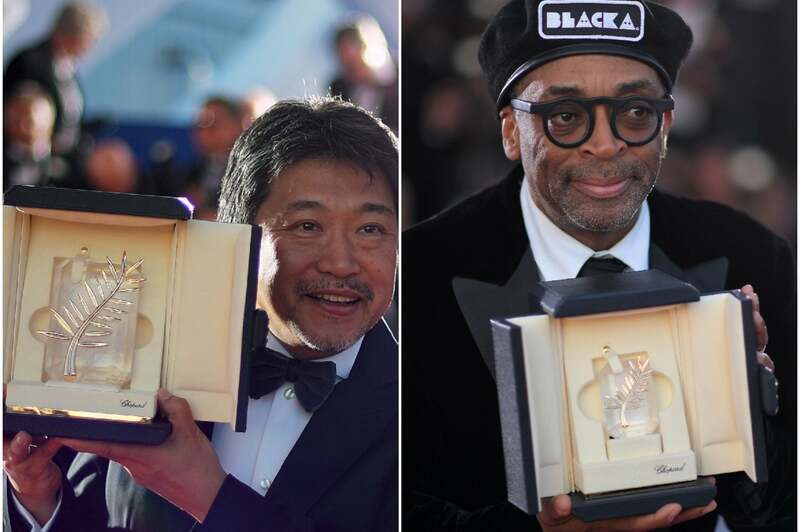 BlacKkKlansman, Spike Lee’s instant Cannes hit, walked away with the Grand Prix, holding the second spot to Hirokazu Kore-eda’s Shoplifters, winner of the 2018 Palme d'Or. Two of three female-directed films in the main competition won awards: Nadine Labaki’s Capharnaum too the Jury and the Ecumenical Prizes, and Alice Rohrwacher’s Happy as Lazzaro took the screenplay prize, a tie with Jafar Anahi and Nader Saeivar’s 3 Faces. Italian actor Marcello Fonte took home the award for best actor for his work on Dogman, with Samal Yeslyamova winning for Best Actress for her solo tour-the-force in Ayka. In other competitions, Lukas Dhont’s debut film, Girl, won the Camera d’Or and the Queer Palm, with Ali Abbasi’s Border taking the top prize at the Un Certain Regard sidebar. The Brazil-Portugal-France co-production Diamantino won the Critics’ Week, while Gaspar Noé’s controversial Climax won the top prize at the Directors’ Fortnight. Louis Roederer Foundation Rising Star Award: Felix Maritaud, Sauvage.